When I thought about what to do for my project today I knew I wanted to do something with a Christmas theme. I thought back to my childhood and remembered sitting in the family room stringing popcorn with my brothers while my dad set up the tree. Half the popcorn ended up in our tummies instead of on the tree, but we sure had a great time! 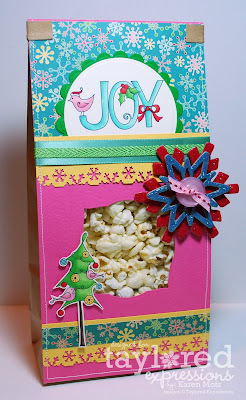 So I decided to do a popcorn themed project. 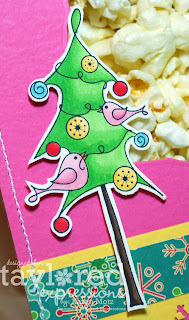 It started out in my mind as a "Tree Trimming Kit" (just add needle and thread) but it evolved more as a wonderful hostess gift. 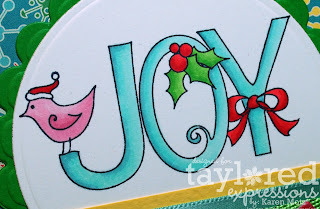 You could easily personalize this by replacing the 'JOY' with a specific person's name. 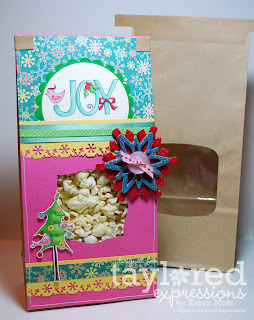 Wouldn't it be fun to start a family tradition by giving each child their own bag of popcorn to string?!? I started with a plain Kraft Bakery Bag as my base. I wanted it to be bright and cheery so I pulled out my Christmas Key Ingredients. I cut the pink cardstock to the size of the bag but I didn't want to fiddle with cutting out the window exactly as it is on the bag so I used my Labels 3 Nestabilities to create the opening in the pink cardstock. The images are from Wings of Joy...I just love this set! I stamped them with Memento Tuxedo Black onto Choice Buttercream and coloured them with copics. The chipboard snowflakes were fun to alter. First I coloured the red one with a red copic then I covered it with Rockstar Red Sparkly Fluff (from the Christmas Key Ingredients). For the blue one, I coloured it with a blue copic then covered it with Waterfall Stickles. 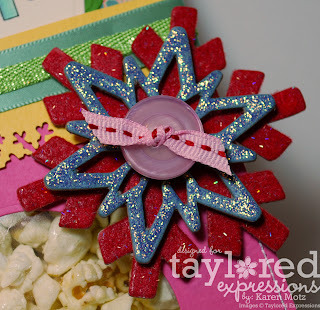 I layered them together and added a pink button from my Rhonna Christmas pack. Don't forget to sign up for the TE Newsletter if you aren't already a subscriber. OMGOSH Karen this is STUNNING! I wouldn't want to open it it's so pretty! I would though...ha love popcorn ;) Would defnitely have to reuse it though. GORGEOUS! Yummy! Love the images, the colors, the snowflakes... I could just eat this up! TFS! this is so cute, Karen! I LOVE popcorn but never thought of packaging it for a treat! TFS! Oh boy my sweet friend!! This is amazing and what a nice idea to give one to each of the kids to help with the tree!! What a nice tradition that would be!! SUPER cute Saucy! What a FAB idea and darling execution! LOVE every bit of this!! This is too cute and yummy!!! You are very clever! Love this stamp set, it looks great!